A Senegalese journalist says he was accosted by a member of Senegalese President Abdoulaye Wade’s security team at an event in Washington Monday evening for previously writing about our report on the Millicom scandal — a report that painted the Senegalese government in a negative light.The Millicom scandal, for those who have not followed it, was an alleged attempt by the Senegalese government to shake down telecom provider Millicom for $200 million for a new licence to operate in the country. Millicom sued Senegal’s government in a World Bank court, a legal filing for which was the basis for the events described in our story. 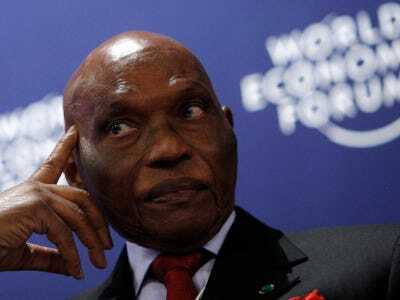 The article caused a stir in Senegal, leading to denials of corruption by President Wade and other high-level officials. The story was also covered widely in the Senegalese press. 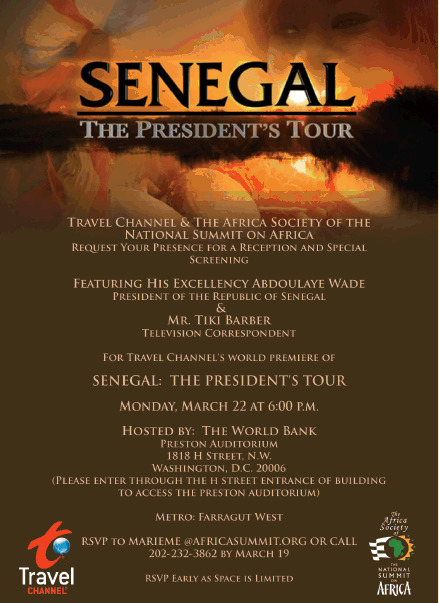 On Monday, Baba Aidara, the Washington correspondent for Radio Futur-Média, a private Dakar-based station, was covering a film screening hosted by The National Summit on Africa and the Travel Channel at the World Bank. Senegalese President Wade flew from Dakar to attend the event, which was produced to boost tourism and whose launch featured media personality and former football star Tiki Barber and U.S. Rep. Donald Payne. Aidara says he then tried to explain that he was permitted to attend the event, showing his credentials, including a temporary World Bank ID and his press pass from the U.S. State Department’s Foreign Press centre (which the FPC confirmed to us is active and valid).The security agent then pushed Aidara with both hands on the chest and said “you have got to leave,” according to Aidara. He was then walked from the auditorium, out the doors, and into the hallway. Aidara says he then presented his credentials to the U.S. Secret Service in the hallway, who said he was indeed allowed to cover the event. But a second member of President Wade’s security detail intervened, according to Aidara, and was overheard saying, in Wolof, “He’s the one who interviewed the liar from Business Insider who wrote the Tigo article.” (Tigo is Millicom’s brand in Senegal). Aidara says he then turned over his World Bank ID pass and left the building, not wanting to create more of a scene. Mamadou Mountaga Gueye, Counselor Minister at Senegal’s embassy in Washington, says Aidara was not invited to the “private” event. Gueye confirmed that Aidara was escorted out of the event, but said he could not speak to other details, including about Aidara being pushed, because he did not directly see it. There’s disagreement about whether Aidara was explicitly given permission to attend. Gueye says he was not. The National Summit on Africa, the organisers, also say he was not on the general RSVP or press list for the event. 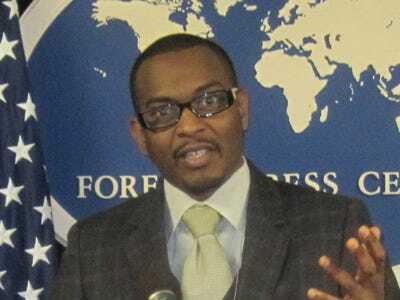 Aidara says he called the National Summit on Africa two days before the event and was told all he needed to do to attend was to come with proper press credentials. Aidara says he was screened by World Bank security and then a staff member from the Summit personally escorted him into the event from the H Street entrance. (Bernadette Paolo, President & CEO, says she is not aware of a staffer letting Aidara in and notes security tensions were high with anti-Wade protesters outside). Michaé Godwin, a publicist for the Travel Channel, a co-organiser and host, did not immediately respond to a request for comment. Regardless, it’s clear that other media were in attendance and the Senegalese government did not want Aidara, an accredited journalist, there. While Senegal has a free press often critical of the Wade regime, including RFM, there have been “numerous long-standing censorship and intimidation practices,” according to the Committee to Protect Journalists. Dieng, the PDS official, says Aidara should have been allowed to report the event.